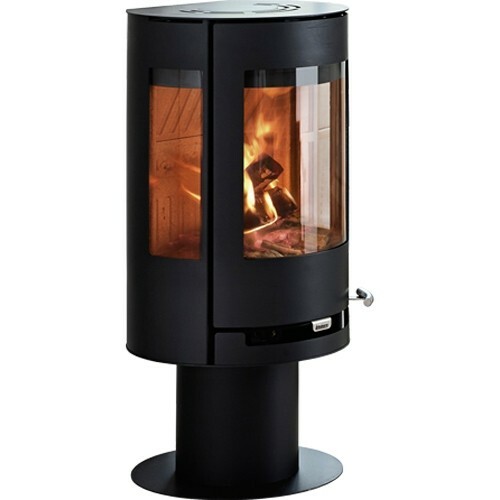 The Aduro 9-3 is the first wood burning stove on a pedestal in the Aduro series. This combined with the huge areas of glass makes it a natural focal point in your living room. The pedestal gives the stove a modern look while the rounded shapes gives it the elegant look which is typical for Aduro 9 stoves. With details such as hidden hinges, a storage space under the stove and a specially molded vermiculite in the combustion chamber Aduro 9-3 gives a solid impression. Further an effective glass cleaning system ensures great visibility to the flames. The effective combustion chamber in the Aduro 9-3 is the same as you can find in the other stoves in the Aduro series. Further, the unique Aduro-tronic technology makes the oven easy to operate. The Aduro 9-3 is a C02 neutral heat source which lives up the strictest environmental standards.